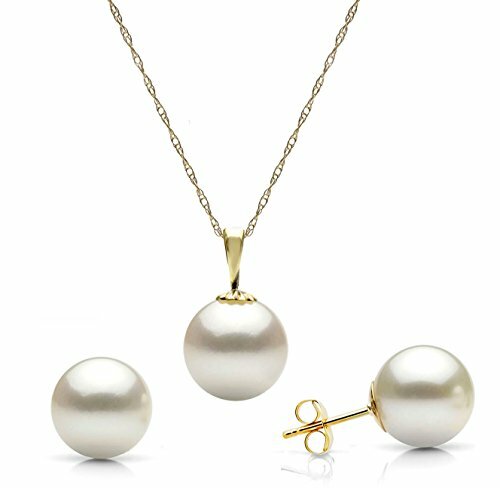 Included FREE with your cultured pearls set is an Appraisal Certificate prepared by a Pearl Expert describing in detail your set size, color and body shape. A color picture of your set is shown on each certificate to ensure carefree insurance claims should those ever arise. It is a wonderful keepsake that shows you truly care. Create a WOW! Experience with a FREE matching gift box. Our boxes are exclusively designed for PearlsOnly to gently hold your cultured pearl set during shipping and also to be breathtaking when your cultured pearl set is unwrapped and opened. With a focus on detail and elegance, the overall packaging from outside wrapping to inside, creates an unforgettable opening experience. Easily care for your cultured pearls set, with a FREE silky storage pouch to protect your cultured pearls set when you are not wearing it. Although cultured pearls are very easy to take care off, we do include a FREE Pearl Care Card, so that you can easily know how to best take care of your cultured pearls set to keeps its value and beauty. 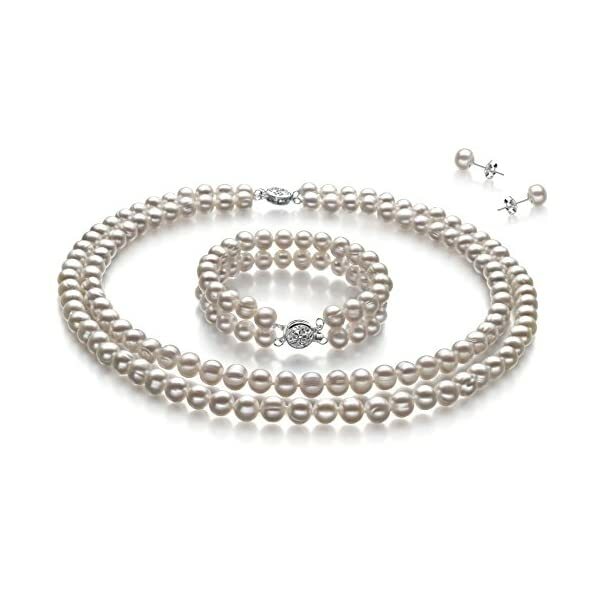 You’re sure to love this set of double-strands of white freshwater cultured pearls for nearly any occasion you choose. 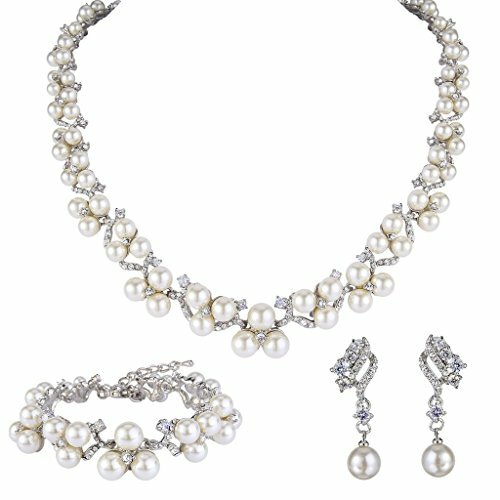 This set is a part of hand selected selection of gorgeous freshwater white cultured pearls. You’ll adore the flexibility of the 6 to 7mm size. Perfect for both casual and formal events. This beautiful A quality set features outstanding AA luster, slightly off round AA shape and A body. 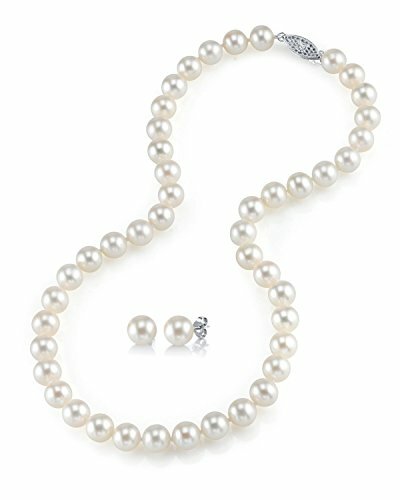 This set consists of a beautiful 6 to 7mm white cultured pearl necklace, accompanied by a matching cultured pearl bracelet and a pair of sterling silver post mounted cultured pearl earrings, Included are matching butterfly backs to secure the fine and beautiful earrings. and brass double clasps. The bracelet default length is 7 inches, and the necklace default length is 16 inches for the inner strand and 17 inches for the outer strand. On the other hand, you may order any length you choose. This set is carefully hand strung, using the double-knotted finest silk thread. Purchasing a complete ensures that all your cultured pearls will be perfectly matched. A set also offers versatility in combinations and looks. Your set will be carefully packed and shipped to you in an elegant velvet lined box and accompanied by lots of free extras. And, if you choose, we would be delighted to gift wrap your set and turn this set into an unforgettable gift. Create a WOW! Experience with a FREE matching gift box. Our boxes are exclusively designed for PearlsOnly to gently hold your cultured pearl set all through shipping and also to be breathtaking when your cultured pearl set is unwrapped and opened. With a focus on detail and elegance, the overall packaging from outside wrapping to inside, creates an unforgettable opening experience. 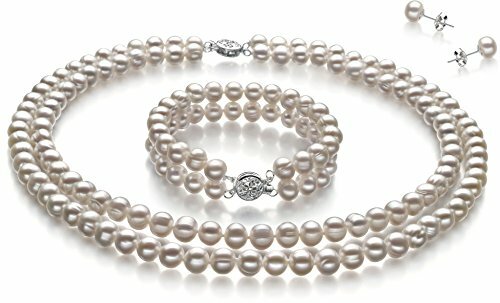 Easily care for your cultured pearls set, with a FREE silky storage pouch to give protection to your cultured pearls set when you aren’t wearing it. Although cultured pearls are very easy to take care off, we do include a FREE Pearl Care Card, as a way to easily know how to best take care of your cultured pearls set to keeps its value and beauty. We want to be 100% satisfied with your purchase and that is why we offer 30-day returns on all of your purchases. Returns are easy and should you want to return or exchange an item, our customer care team is ready to assist you around the clock. And with a huge selection of Freshwater Cultereed Pearls, Japanese Akoya Cultured Pearls, Saltwater Cultured Pearls, Tahitian Cultured Pearls and SouthSea Cultured Pearls you’ll be able to find such a lot of things to suit your taste.